Contact The Maryland Fur Trappers, Inc. Membership Secretary - Reed Muse, 3499 Niner Road, Finksburg, MD 21048. Districts 3 & 4 (Washington & Frederick County) - Larry Emswiler (301-253-5869) or Butch Glenn (301-465-0196) or email trapnfox@gmail.com - Second Tuesday each month beginnning in September, 8:00 p.m.
District 8 (Kent & Queen Annes County) - Roger Ringgold 410-634-2552 rogerringgold@ymail.com Meetings the fourth Tuesday each month thru trapping season at Robert Colloway's home. Call 410-634-2501 for directions. 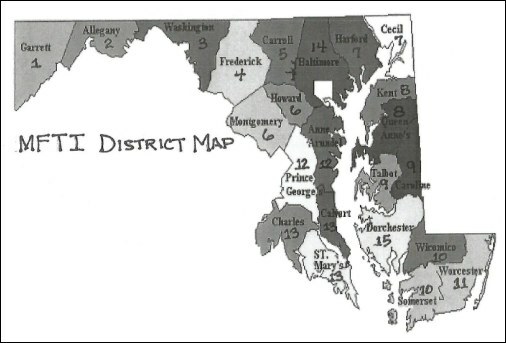 District 12 (Prince Georges & Anne Arundel Counties) - See District 13 listing. District 13 Director (Calvert, Charles, St. Marys, P.G. & Ann Arundel Counties) . Meets third Tuesday of each month. Brian Droneberger 443-964-8388.